Should Driving Age in Georgia Be Raised? This is a fair-minded debate about whether the driving age in Georgia should be raised. Today, the Insurance Institute for Highway Safety announced its position that the driving age should be raised in all states as a safety measure. It is a known fact that car wrecks are the number one leading cause of death among teenagers. 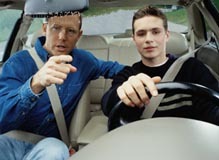 The research shows that if the teen driving age were raised, teen deaths in car wrecks would go down. Simple math. Of course, that was also in a town of 1800 people, not a city like Atlanta of 5 million. Big difference! As a plaintiff’s personal injury attorney, I have seen for myself and have represented way too many grieving parents who have lost their teenage son or daugther to a reckless car accident that never should have happened. A change in the teen driving age would help avoid this needless suffering for so many families. Georgia, however, is a big state and is largely rural and agricultural and so I doubt whether the Georgia Legislature would ever seriously entertain an increase in the driving age…but don’t you think they should? Let your State Senator and State Representative know how you feel.